Does "green" investment really pay off? More than seven years later, with renewable energy in South Australia at last expanding rapidly, , the GG has revisited his 2011 portfolio. But with the benefit of hindsight, it makes interesting reding and has inspired him to renew active management of the portfolio, using �such sophisticated tools as flipped coins, gut instinct, and the careful analysis of green tea leaves.�Investment adviser he is not, but he hopes to have fun and if he doesn’t have fun he must be learning something. So far he has lost a small fortune. �But it is all about the future . . .
BE NOT downhearted, all ye chlorophyl-coloured capitalists! �All is not�lost! �OK, more than half of it has gone down the�gurgler, and will almost certainly never be seen again. But what a learning experience! Do not set and forget. �Especially when investing in the speculative end of the market. If you are going to invest in the stock market, you are going to have to monitor and manage your portfolio on a regular basis or pay someone else to do so. �What possessed the Gambler, for example, to let his investment in Australian Renewable Fuels wither from $2.60 a share to zero, without ever selling? Leaving a portfolio untouched for seven years was a recipe for disaster. Much of the Gambler's losses reflect that the fact that he sat on his hands and did not keep topping up or dumping his holdings. �These tiny companies, putting their faith in cutting edge technologies, typically need constant injections of cash. So almost every year they sell more shares to their shareholders in return for the spondooliks they need just to stay solvent a little longer. �Shareholders who don’t buy the additional shares see their percentage ownership of the company reduced. �Those who do, all to often just �add to their losses. Having painfully absorbed both lessons, the Gambling Greenie is reviewing his portfolio in a renewed �attempt to generate some loot from planet-friendly enterprises on the stock market. � At the risk of throwing good money after bad, the Gambler will look at topping up some of his remaining holdings. �But given the current weakness in the share market, he is in no hurry. OUT. �Failed biofuel hopeful Australian Renewable Fuels (ARW) was absorbed by technology investment fund, Thorney Technologies (ASX code TEK), managed by the private Thorney Investment Group. �In the real world, the Gambling Greenie would have to hang on to these shares because they are worth so little they have become an�“unmarketable parcel” �i.e. almost impossible to sell. �But for the sake of simplicity, the Gambling Greenie is writing them off completely as a dead loss. OUT. �Failed energy storage company CBD. Became BlueEnergy, moved its base to the US, and was last seen trading for less than two US cents. �Worth less than the cost of selling them. ALMOST OUT. �Dyesol, now known as Greatcell �Solar �(GSL) , is �on life support, awaiting a cash transplant from Turkey. Trading suspended since March, so the Gambler can’t sell the shares. �If the Turks come good, he may not want to. IN AND IN. 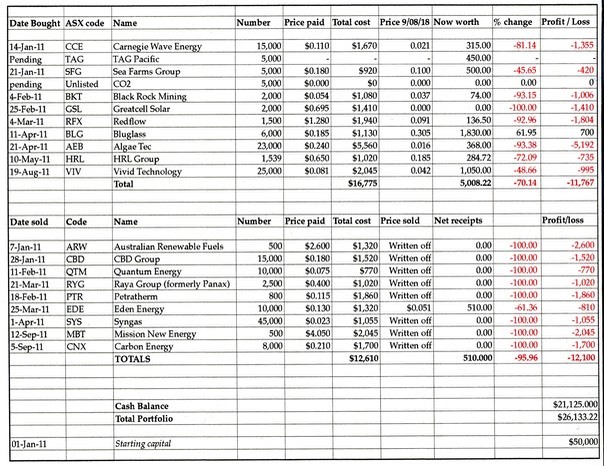 �The GG’s investment in�Carnegie Clean Energy (CCE) has been a big disappointment, �despite years of research and millions of dollars invested by the West Australian and federal governments. Although a commercial trial is still operating at Garden Island in WA, Carnegie’s big buoys �still seem to be a long way from generating profits. �CCE shares had a bit of a boost when they acquired microgrid specialists Energy Made Clean, which took them into solar as well as wave energy. But now Carnegie has agreed to sell EMC in an all-scrip deal with TAG Pacific (TAG). The deal depends on approval by the shareholders of both Carnegie and TAG, hopefully around the end of August. �If it goes through, Carnegie will give its shareholders the TAG shares it receives. �Quick calculations on the back of an envelope, based on a TAG price of $0.084, suggest the Gambling Greenie will get about 5,000 TAG shares worth around $450. �TAG reckons the deal will make it a the biggest microgrid and renewable energy company in Australasia, with confirmed orders worth $20 mln and a combined revenue of some $50 mln for the year ended in June. �However, TAG needs cash, and is planning a share purchase plan. �If that doesn’t succeed, the deal is off. �The GG’s CCE shareholding is now worth so little it is virtually unsaleable, and his forthcoming allocation of TAG shares at the current price is not much better. �However, TAG would appear to have real potential, so both stay, for now. OUT. �Heat pumps have never made Quantum Energy�a hot stock. �The managing director, John Walstab, will effectively control the company with some 47 per cent of the shares, when shareholders give the nod to his buying a large block of shares being unloaded by the company’s biggest shareholder. �Once again, the Gambler’s investment is worth so little it is an�“unmarketable parcel”. �The shares are hardly ever traded anyway. �Another write-off. OUT. ��Eden Energy, now renamed as Eden Innovations, still has a small toe in the waters of renewable energy through its Optiblend gas/diesel blended fuel but with sales of only around $US240,000 a year it is hardly significant. �However, it has been making real progress in �its new business of improving the strength and durability of concrete by adding carbon nanotubes. �Research is continuing into reinforcing plastics with the nanotubes, which originally were a by-prodcut of its bydrogen production process.The company may have potential, but it is no longer a real greenie, so out it goes. OUT. �Syngas. �Surviving largely on funds lent by one of the directors, Syngas is little more than a shell, trying to find something to do that might earn some money for shareholders. �Some thriving private�enterprise�might decide to buy the company as a backdoor way of gaining a stock exchange listing, but the GG is not going to wait. IN. �Bluglass is a technlogy company which has been working for years on a better way of making semi-conductors for smart lighting and consumer electronics. �It is still burning cash, and is years away from making a profit, but it does have some revenue and a�recent rights issue brought in an additional $10 mln. �It stays, for now. IN. �Algae.Tec began with dreams of growing algae using the carbon emissions from power stations to grow algae and produce biofuel. �It is now more of a would-be nutraceutical and medicinal cannabis company. �It is actually selling some product, so rather than locking in his losses, the GG will hang on to this one for a bit longer. It is changing its name to Affinity Energy and Health, and hoping to get an Australian medicinal cannabis licence before the end of September. But it will need to find a strategic partner to help finance and run any Aussie cannabis operation. IN.� Hot Rock has had to write down its share capital, consolidating its shares on a 13:1 basis. However, it had the foresight to get out of the geothermal caper early and has become the HRL Group, �a laboratory-based sampling and testing company for the food, hygenie, construction and environmental industries. It has made the transition largely through takeovers of existing businesses. �Earlier this year it completed its biggest takeover yet, buying Analytical Laboratories of New Zealand. �It has doubled it sales to $27mln �in the past year, has a $4.6 mln cash flow and an estimated underlying profit of $5.8 mln before interest, tax and depreciation. �Looks like a bit of a winner. IN. �Greenearth successfully switched from geothermal to high-tech efficient lighting for commercial companies. It now trades under the name Vivid Industrial, with the ASX code VIV,. It reckons that the efficiency of its lighing has saved over 31 mln kWh of energy �so far, saving the equivalent of nearly 12,000 tonnes of coal, or 55,000 barrels of oil. �It also has a stake in an Israeli invention turning Co2 into fuel. �This�NewFuelsCo2 technology has now been taken up by Sinopec Engineering Group in Beijing, which hopes to bring the technology to the commecialisation stage. OUT. �Carbon Energy was seeking to commercialise an improved underground coal gasification process developed by the CSIRO, and was making real progress at a site in Queensland. �The debacle of coal seam gas, and in particular Linc Energy, which caused serious pollution, �poisoned the politics to the point where no amount of approval by independent scientists or government regulators in Queensland could save Carbon Energy's Queensland operation. �The company has since taken its technology to China, and is seeking partners to help it use its technology to produce hydrogen from the Cooper Basin in South Australia and in Japan. �It reckons it can produce low-cost hydrogen without Co2 as a by-product. The company is now 80 per cent owned by Kam Lung Investments, an offshoot of the Hong Kong and Shangai Hotel Co. �The CSIRO technology could be a big winner for the Chinese, but a share consolidation last year cut the Gambler’s stake to a mere 80 shares, worth a total of $8. �Not worth keeping. OUT. �Mission New Energy. �Suspended indefinitely due to non payment of ASX annual listing fees. Sole asset appears to be a 20 per cent stake in a Malaysian biofuel plant. A plan by an Australian building products firm to acquire MBT’s stock market listing via a reverse takeover has fallen through. �A write-off.